I do love to dip my paws in a cool river. But the truth is, I don’t like it if I can’t touch bottom. Some dogs love swimming & are very good at it. But it’s important to be safe & smart. A dog should get some swimming lessons because not all of us are naturals at it. The younger your good dog is when you teach him or her to swim, the better. Keep the lesson short, positive & as stress-free as possible. Choose a quiet, shallow spot in the water for your lessons. Keep your dog on a leash while he or she is learning. Get in the water with your dog, let them know this is a fun thing to share. Start at the edge of the water & stay as long as he or she enjoys it. never force your dog into the water if he or she doesn’t want to go. When at the beach, try not to let your dog drink the water ( not always easy). It might cause stomach issues, so always have fresh water with you. 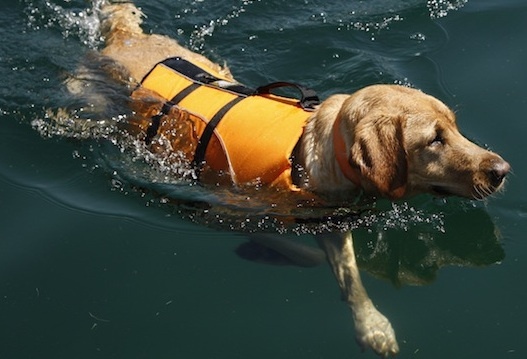 If you go out on a boat, always have a bright colored life jacket for your dog. If you have a swimming pool at home be sure to have a fence around it to keep your dog out when it isn’t time to swim. Be sure your dog has an easy way to get in & out of the pool such as steps or a doggie ramp. Also be sure the water isn’t too cold because not all dogs can cope with really cold water. After swim time it’s a good idea to rinse your good dog in clean water. Be sure to gently dry the ears as well. Play safe & stay cool. I wonder if the pool was gassing or giving off a strange odor that repelled Kasper? Others want nothing to do with it if it isn’t in their water bowl.